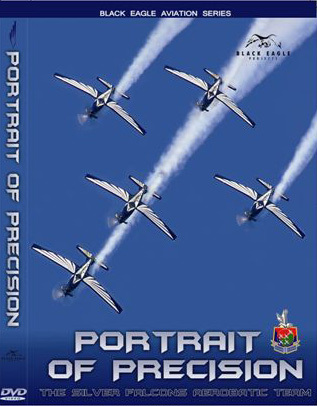 This film gets you into the cockpit with the elite SAAF formation aerobatic team, the Silver Falcons. Showing the team members in work and play and the incredible challenges and euphoria of military display flying. Exclusive footage from just about every angle possible, interviews with some of the legends of the South African air show circuit. Music by the Parlotones and Summershade. Footage from AAD 2008 when the new colours were launched and Captain Buti Tsebe did his first display to AAD 2010 when the team flew a formation sortie with a United States Air Force C-17 Globemaster. With footage of the displays during the opening ceremony of the 2010 World Cup when it was estimated that 2 billion people watched the display. The film is 98 minutes long and has an extra section in it of a full display from the cockpit. Produced by Black Eagle Projects in 2010. This product was added to our catalog on Friday, 24. December 2010.